Please read Warning and note sections throughout this guide. They contain important information! 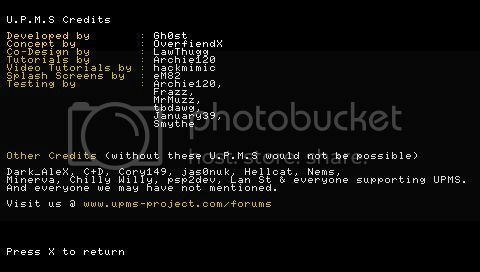 *UPDATE* 4/8/08 - UPMS v4 released. This app is awesome! It will install everything that needs to be on a Ultimate Memory Stick as well as change the battery to a Service Mode Battery. So, here is my guide to understanding everything this program can do. Back up your memory stick. We are going to do a FULL install from scratch so you get the idea how to use it, and to be able to do Step 3, and install the latest versions of the Ultimate Loader, etc. Format the memory stick using any tool. The reason for this is that the installer can pick up whether or not the MS is a UPMS, and if it can pick that up, it won't install nothing. (Being that you already have some of it) You will just get this. This version has everything, and it will write the same utilities (MaxSafe, KeyCleaner, etc.) You will have to still grab those EBOOT update files. Still available here. Moving on... To install this, you will just have to do some basic file transferring. Fire up USB Mode. Find your memory stick. You will have to create a new folder on the root called 'ISO'. (If it's not already there) From there, drag the .cso file to the new folder. From there, go back to the root, and then find your way to PSP>GAME. If it isn't there, create a folder named 'PSP', and a folder within the PSP folder called 'GAME'. This is to make ISOs appear on the Memory Stick from the XMB. Grab the 1.50, the 3.71, 3.80, and 3.90 update files. Rename the 3.71 EBOOT to '371.PBP'. Rename the 1.50 EBOOT file to '150.PBP'. Rename the 3.80 update to '380.PBP'. Rename the 3.90 EBOOT to '390.PBP'. All of these files get transferred to the root. These files are necessary for creating and using Pandora, and DCv3-5 and to max out the full potential of UPMS. Disconnect USB, and scroll right to the GAME category. Go down to Memory Stick. Press X. The only game that should be there should be the installer. UPMS Installer. -If you are on 3.80 M33+, and HAVE the 3.71 fatmsmod.prx patch already installed, press X. -If you are on 3.80 M33+, and HAVE NOT installed the 3.71 fatmsmod.prx patch already, press . -If you are on 3.71 M33 or below, you won't get this screen. -If you are using a fake memory stick, press O to reformat your memory stick for UPMS. -There's no reason to use Triangle, but if you are getting flash1 read errors from creating access points in the XMB or elsewhere, you can remove it or format flash1. 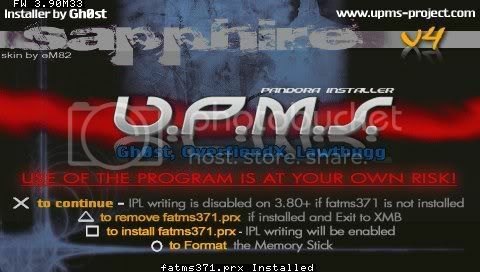 -Install Time Machine IPL to Memory Stick - Writes the TimeMachine ipl if you are going to use TimeMachine. -Install Booster's Multi-IPL to Memory Stick - Write Multi-IPL to boot to XMB and have Pandora Battery. -Install Sleep Fix Multi-IPL to Memory Stick - Sleep Fix for Multi-IPL. Restores sleep mode. NOTE: This menu is disabled for TA-085v2 users. You can use both a Phat and Slim battery. -Backup Battery to (Ms0:eeprom.bin) - Backups current serial to 'eeprom.bin' on MS.
-Restore Battery eeprom from (mso:eeprom.bin) - Restores eeprom from file on MS.
-Restore Serial only from (ms0:eeprom.bin) - (0xXXXXXXXX) - Restores backed up serial. -Install U.P.M.S. without Utilities (fastest). Step 3 deals with installing all of the firmware stuff including the unbrickers, loaders, and what not. All of the things that you had to install as separate apps are all compiled to one option. If you do this option, you can choose between two options. Install the Ultimate Memory Stick with the utilities, or without. You should install with utilities. If you install without utilities, you can still copy them to PSP/GAME with Step 4. However, if you install with utilities, there will be no need to do step 4 since everything gets copied over. Whatever you install, it's going to be installed, and you will see everything get written. After this step, you have completed installation of the U.P.M.S. Step 4 isn't required if you install utilities already. Choose one. Choose DCv3-5 if you are on a Slim. Any option can be used for a Phat. If you plan on downgrading to 1.50 via the original Pandora, you will need 'UPDATE.PBP'. The installer will offer to make this for you. If you do not need to, you can decline. If you accepted (or not), the install will continue and you will get this. -Install MUX21 - Utility that allows you to keep various 'UPDATE' folders on MS.
-Install KeyCleaner - Chilly Willy's KeyCleaner. Fix some of your IdStorage Keys. Ability to dump as well. -Install IDStorage Manager - Chilly Willy's app again. Allows you to manually edit your keys. -Install ConfigCleaner2 - Cleans out your configuration and registry in flash1. Also gives the option of backing up and restoring them. -Load TimeMachine installer by Dark_Alex - Self explanatory. Credits in an organized list. -Take out battery, and memory stick. Note: A.If you have a corrupt 'opening_plugin.rco' in flash0, you won't be able to boot to XMB, or recovery. You can restore this via UL, or by using an unbricker. B.If the UPMS, and Pandora Battery are already inserted, shutdown the PSP. Reboot, and hold L. That will boot to UL. Note: Hellcat's Pandora Menu won't be available on a Slim. -Despertar Cementerio is the unbricker by Dark_Alex. Used to upgrade to 3.71/3.80/3.90 M33 (and counterparts), and to dump and restore nand images. Note:You can restore a nand-dump from another PSP, but only use this as a LAST RESORT. -L button switches folders between the three menus. (The current folder is shown in the bottom-right of the screen) Automatically switches when you choose a menu to load. Home shutdowns your PSP. Confusing? All of this is at the bottom of the UL. -USB options are at the bottom as the last option. Press X to activate what's it is set to. You can change between ms0, flash0, and flash1. Note: Flash drive access is disabled on a Slim. -To use Despertar Cementerio on a Slim, you must have last used it. You can force a folder change to DC by doing the following: You will know that DC is the active as the PSP will boot to this. 1)Remove battery and power off. 3)Hold L Trigger, and insert Pandora battery. 5)UL will switch folders to DCv3. When that happens, move the switch back to its normal spot without putting the PSP to sleep. Have fun with UPMS. All credit goes to original authors.. Tip: Despertar Cementerio sometimes refuses to format flash0-2 and it hangs, you have a corrupted lflash in your nand and you will need Cory's nandTool to fix it. From there, reboot into service mode to UL. From there, go to Tools menu, and then load Cory's nand Tool. When you load the menu, hit 0, and then go down to 'Other', and 'repartition lflash'. When it finishes repartitioning, reboot into Despertar Cementerio. It should successfully format flash0-2 now. Note:Despertar Cementerio v3 installs 3.71 M33-2. Despertar Cementerio v4 installs 3.80 M33-5. Despertar Cementerio v5 installs 3.90 M33-3. Make sure you upgrade to 3.71 M33-4, if you flashed with DCv3. Also, after you flash, you installed the 1.50 kernel addon and the 3.71 fatmsmod.prx patch if on 3.80 M33+. Note:Slims will only have access to Despertar Cementerio v3-v5 the Tools Menu, and USB access to ms0:/. Tip:Be a good sport. If this works for you, spread the joy to your other friends with PSPs.
? : What happened to Joker's menu? A: With the release of DCv5, it has been integrated into the UL and it replaces Joker's menu.
? : Why no guide about TimeMachine?
? : What about Despertar Cementerio? A: Make sure your battery is in Service Mode, you have written the ipl, and you are on the proper menu. (DCv3-5 for Slims) Also, if you use TimeMachine, you must hold L (or d-pad up) to load the menu. Also, make sure that you DID NOT delete the 'vsh' or 'kd' folder from your MS. (Which is on the root) The files for UL are in there.
? : Anyway to get around UL wanting you to backup your nand/ids? A: On the root of your MS, delete the 'dic' 'vsh', 'kd', 'registry', and other flash0 folders from your MS. (The root. DO NOT DELETE THE VSH OR THE KD FOLDER!) You will not need them on a Slim. You can use TimeMachine to boot into a more stable 1.50. However, you cannot use all the features of Hellcat's EBM if deleted. Afterwards, delete the 'UPDATE.PBP', and the firmware files for whatever Despertar Cementerio version you will not use. (Delete '371.PBP' if you not gonna use DCv3, '380.PBP for DCv4, and '390.PBP for DCv5) If you do this, be careful on what version you launch. DC formats flash0-2 before it searches for the firmware file. Delete '150.PBP' if you do not use a Phat or don't install the 1.50 kernel addons. i already have a thread about this. and yes UPMS is awesome! glad to see new faces that contribute. upgrade to 3.71M3303. it will work. this application just makes it easier in my opinion. If i already have a pandora battery, i can just make the memory stick yeah. Or do i need to do the battery again? In the read me for u.p.m.s it does not say anywhere to duplicate the 1.50 pbp and rename it to UPDATE.pbp !! , im the last version of upms ,which did say use this method but not for the latest release . 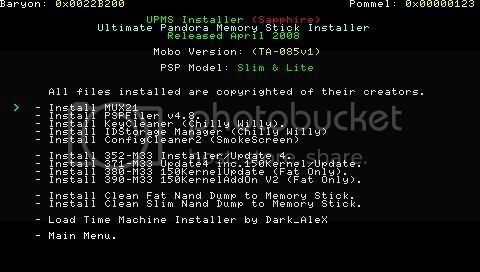 if u already have the battery then just skip that option when making the memcard with this great easy noob proof pandora memstickmaker.